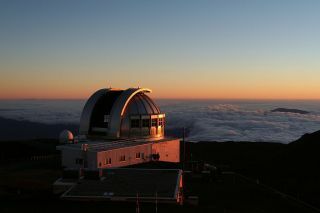 The announcement of the closure of a third telescope on Hawaii's Mauna Kea fulfills the request of the state governor. A British-built observatory located on Hawaii's tallest mountain announced last week that it would be closing, meeting the request of Hawaii's Gov. David Ige to shut down 25 percent of the telescopes on the mountain, in order to facilitate the construction of the Thirty-Meter Telescope (TMT). The UKIRT observatory, located on the dormant volcano Mauna Kea, "had already been identified in the Mauna Kea management plan … as one of the telescopes that will not be recycled after the end of its productive life," Guenther Hasinger, director of the Institute for Astronomy at the University of Hawaii, which runs the telescope, told Space.com by email. Located on the island of Hawaii, Mauna Kea's high altitude and dry environment make it one of the best sites in the world for astronomical observation. Since the 1960s, 13 observatories have been built on and around the mountaintop. However, many people in the region also consider Mauna Kea sacred. During the TMT's 2014 groundbreaking ceremony, the telescope attracted significant controversy, and construction was halted earlier this year due to protests, several of which resulted in arrests. In May, Ige announced a plan to enhance the stewardship of the mountain, calling for the removal of at least 25 percent of the telescopes by the time TMT is ready for operations. The Caltech Submillimeter Observatory has since closed down operations, while the University of Hawaii at Hilo has initiated the decommissioning process for its Hoku Kea telescope. UKIRT marks the third instrument to announce its closure, meeting the governor's goal. Formerly known as the United Kingdom Infrared Telescope, UKIRT began operation in 1979. Ownership was transferred to the University of Hawaii in 2014. "Over the past several years, UKIRT has become one of the most productive telescopes on the globe," Hasinger said. The measurement of productivity is based on the number of publications using UKIRT data and those papers' corresponding impact. Hasinger said he attributed UKIRT's productivity to a set of very large, specialized imaging sky surveys performed by the telescope that a significant number of researchers use. The telescope has also discovered some of the most distant objects in the universe, the most notable of which is the most distant known quasar, a supermassive black hole that emitted an incredible amount of light when the universe was less than 1 billion years into its total age of 13.8 billion years. The instrument won't be shut down immediately. Hasinger said that the plan will start some time after the other two telescopes have been decommissioned. "The general decommissioning process for observatories is outlined in the Office of Mauna Kea Management's Comprehensive Management Plan to ensure that the decommissioning is handled properly and in a culturally and environmentally respectful manner," the University of Hawaii said in a statement. UKIRT will continue to operate for several years until it is time to begin the shutdown process, which will involve a site deconstruction and removal plan, and a site-restoration plan. "The whole process needs to be done with utmost care and with public input," Hasinger said.